Imagine having a lot of media files stored on your PC, for example video and audio files and also a huge DVD collection. What would be better than to play them all using a single software and not worrying about installing certain codecs and filters for playing certain types of media files. Finding the right player and codec for a certain file is a lengthy and difficult process and at the end of it, you still may not be able to play the file. Windows Media Player could be a good choice, but the formats supported by it is very limited. Fortunately, there is a software that can play it all and that's Zoom Player Home. The installation of the program shouldn't be a problem for most users, as it's a quick and easy process. The system requirements are lower compared to other media players and the operating systems supported are all the versions of Microsoft Windows. After the installation process ends, the user is asked to install certain codecs and filters. One can deselect the ones that are already installed into the system. After selecting the desired filters, Zoom Player will install them one by one without the user's intervention. The interface of Zoom Player is extremely simple to use and features some graphical buttons for the main controls, like Stop, Play, Next and Previous Track and a button for opening the media file. Right clicking on the program's interface will open a complex context menu which features all the software's options and settings. A beginners shouldn't worry about the complexity of the menu, because all the options are intuitive and self-explanatory, clearly stating their functions. Loading an audio file into Zoom Player will display some information about it, like the playlist position, the name of the artist and album and the path of the file. DVDs can also be played without problems, as the software also supports DVD menus. The options section of Zoom Player Home includes two modes, a basic one for beginners and an advanced mode, for more experienced users. In advanced mode, the user can thoroughly configure the entire functionality of the program and also the look and feel of the interface. This mode is not recommended to be used by beginners. For an easier and better control, the program features keyboard shortcuts for most of the functions. Unfortunately, these shortcuts cannot be customized. The software supports an impressive list of file types. Also, it features keyboard shortcuts, for easily controlling all the program's functions. The large number of options could confuse a beginner. 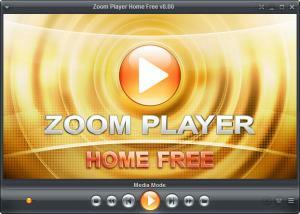 Zoom Player Home is a great software for playing any type of media file you can think of. You can download Zoom Player Free free here.